After yesterday's fantabulous lunch, we were worried that almost anything would lead to disappointment. Good thing we had to run errands westward, as Pepe Rosso to Go is a wee outside our daily lunching range. The quick hot pasta service (though not today) and the friendly and boisterous Italian guys just bring a smile to our faces. The lunch special is a good deal at $8.95 for a filling bowl of soup and a small selection of their panini and pasta. 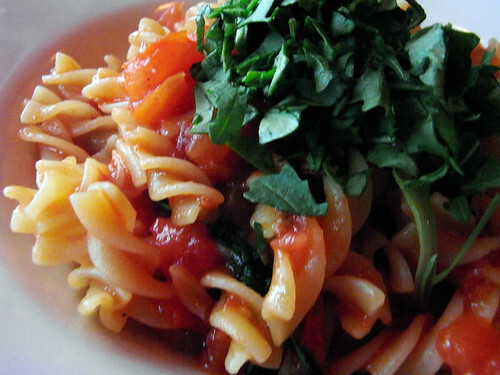 The penne with fresh tomato, basil, & melted mozzarella sounds amazing. What are the portions like? This one was fusilli with fresh tomato and basil (no mozzarella). Portions are perfect - smaller than a normal American portion, but bigger than an Italian pasta course serving. It shouldn't leave a lady too hungry nor too full.